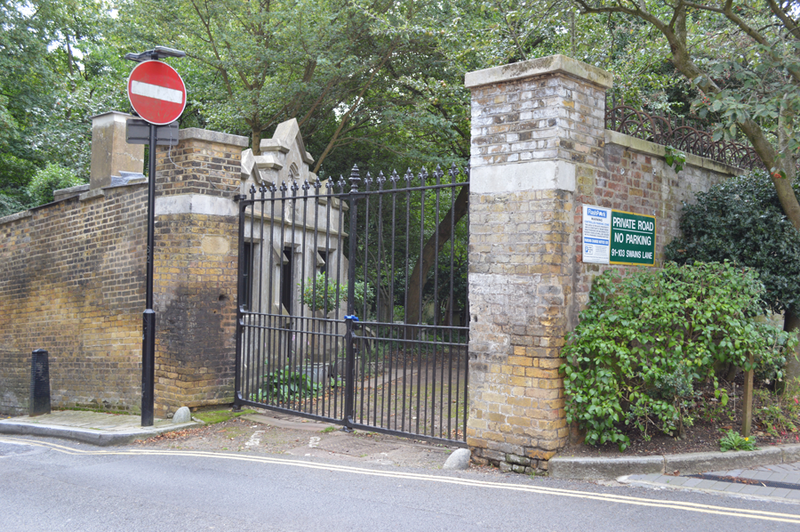 The north gate entrance to Highgate Cemetery off Swains Lane, London. Photo: Erin Chapman. In the previous instalment, “5 Reasons a Wampyr Didn’t Walk in Highgate Cemetery” (Feb. 27, 2015), I discussed major topographical errors in Sean Manchester’s book The Highgate Vampire: The Infernal World of the Undead Unearthed at London’s Famous Highgate Cemetery and Environs (1985; rev. ed. 1991). Front page story: “Does a Wampyr Walk in Highgate?” Hampstead & Highgate Express, Feb. 27, 1970. The photograph of Sean Manchester, which accompanies the original article, has been blurred out to avoid a DMCA infringement complaint from the notoriously litigious Mr. Manchester. Photo: Camden Archive. The time had come to confront them [the public] with this revelation [the vampire theory] so that those already under the fatal malignity could be reached and helped. How many I wondered were keeping this undead nourished? The only way I could reach all the people in the area was to make public my opinion and some of the facts leading up to it. This I did with a certain amount of reluctance as most forms of publicity put investigations of this kind into considerable risk. However, as it was already a topic in the local press, I felt that further harm would be minimal. 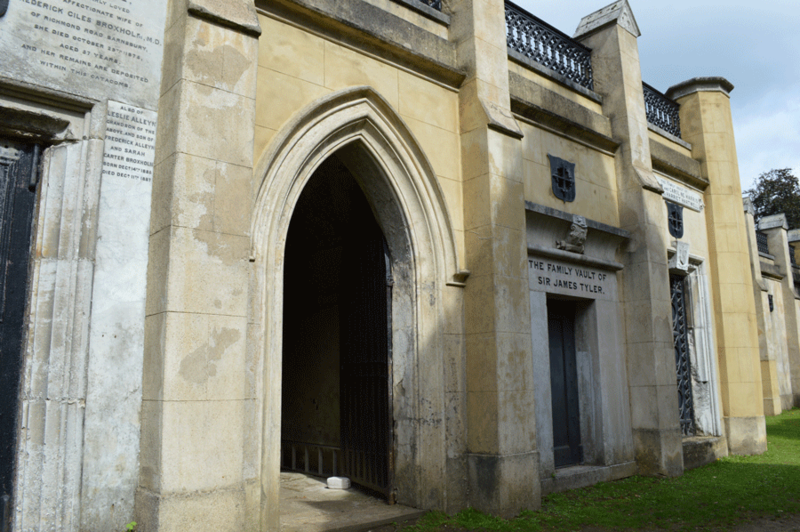 WE DON’T want to frighten you, but the ghost of Highgate Cemetery might be . . . a vampire. SOME NIGHTS I walk home past the gates of Highgate Cemetery. On three occasions I have seen what appeared to be a ghost-like figure inside the gates at the top of Swains Lane. The first occasion was on Christmas Eve. I saw a grey figure for a few seconds before it disappeared into the darkness. The second sighting, a week later, was also brief. Last week the figure appeared, only a few yards inside the gates. This time it was there long enough for me to see it much more clearly, and now I can think of no other explanation than this apparition being supernatural. I have no knowledge in this field and I would be interested to hear if any other readers have seen anything of this nature. Manchester alludes to Farrant’s letter in his book; his quote from an uncredited “report” about a “ghost-like” figure seen three times at Highgate Cemetery (Manchester 1985, 41) is actually Farrant’s letter. The Ham & High’s letter column between Feb. 13–27, 1970 was overrun by people commenting on Farrant’s ghostly encounters or sharing their own ghostly tales—but none mentioned a vampire. Interestingly, many respondents to Farrant’s letter were acquaintances or friends of Farrant and Manchester, though neither of them disclosed their connection at the time (Swale 2014). Farrant wrote a follow-up letter reaffirming his ghostly sightings, published in the Feb. 27, 1970 issue: “You can imagine how relieved I was to discover by the response in the letter columns that I am not alone in witnessing the spectre that haunts Swains Lane.” (Farrant 1970b) However, as folklorist Bill Ellis notes: “the most impressive detail is the sheer amorphousness of the Highgate traditions” (1993, 22). In other words, the sightings were characterised by their lack of consistency. Although a single term, “ghost,” was used for a supposed entity, descriptions varied from “a woman in the porch” (Berger 1970) to “a ghostly cyclist” (Baker 1970). Far from beginning as a “major topic in the local press,” the vampire topic kicked off only when Manchester stepped forward with his theory—making him the topic’s originator, not ruminations in the local press. “Much remains unexplained, but what I have recently learnt all points to the vampire theory being the most likely answer. Manchester’s statement seems incredibly facetious considering he was the vampire story’s progenitor and actively courted press coverage, not to mention witnessing his story’s growth and spread through the Ham & High; incidentally, the only “local press” that covered the story until Today turned its cameras on the cemetery. However, it’s hard to tell whether Manchester anticipated the hysteria of the mass vampire hunt; there’s no reliable indication that he intended it to get that out of hand. Either way, the event was enough to cement the vampire’s place in history, especially when the story gained international coverage through articles like “Horror Film Club Hoax Sparks a ‘Vampire’ Hunt” (Palm Beach Daily News, March 17, 1970). Outside the main gate of Highgate Cemetery West, London, where the Today interview ended up taking place due to apparent complications. Photo: Erin Chapman. Sandra began by asking questions about the vampire. But something was wrong. There was a strange noise interfering with the sound a technician said. We tried again. But it was to no avail; the eerie noises only grew worse. Suddenly, the camera director fainted and fell to the ground. Then it seemed as if all hell broke loose. The wind literally howled and screamed through the trees; wires running from the generator van lashed the icy ground and Sandra’s notes flew all over the place. The man who had collapsed was carried by members of the camera crew to a nearby van and rushed to hospital. Curiously, he had no previous history of fainting and no reason for this collapse was ever discovered. I asked Miss Harris whether she thought all this to be merely coincidental. She could not discount the possibility that it was not. Further attempts to shoot the interview by the north gate were abandoned and the actual interview took place outside the main gate further down Swains Lane. Yes, the camera man did faint, but he was quite old, had heart trouble and he had quite a vivid imagination. The strange sounds turned out to be ‘whoooo, whooos’ from the amateur actors in their sheets or whatever. But it suited our story to make it a bit more dramatic than it was . . . but I have no doubt it was earthly sylphs, nothing super natural. Harris’ version of events certainly puts a damper on the spooky ambiance Manchester was striving to convey in his book. 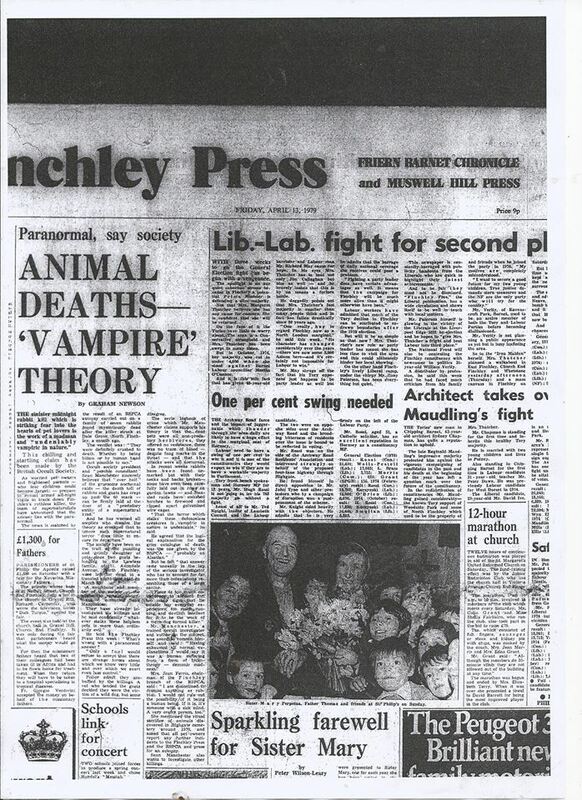 Front page story: Graham Newson’s “Animal Deaths—‘Vampire’ Theory,” Finchley Press (April 13, 1979) featured Sean Manchester’s theories behind the cause of dead animals in the Finchley area. If you guessed “a vampire did it,” give yourself a cookie. Photo: British Library. Dead animals, notably nocturnal ones, kept appearing in Waterlow Park and Highgate Cemetery itself. Further inspection revealed what they all had in common were lacerations around the throat and they were completely drained of blood. She mentioned the ritual sacrifice of animals discovered in Highgate Cemetery around 1970, and asked that all pet owners report any further incidents. Dead animals, notably nocturnal ones, were discovered scattered about Waterlow Park and the graveyard itself. Inspection revealed lacerations to the throat. All were completely drained of blood. Later outbreaks of animal deaths would benefit from an RSPCA autopsy which revealed fang marks in the throat of the victims and the total absence of blood. As you can see from this passage, Manchester merged two separate incidents into one. Finchley is four miles from Highgate; an autopsy was done, but in Finchley, not Highgate—and nine years later. There’s no concrete way to connect the two incidents, proving Manchester’s statements are misleading and falsifying evidence so I am factoring the uncited report out of the equation. So let’s focus on a keyword Manchester used in both editions: “lacerations.” This was an interesting word choice since when linked to his reference to a different wound in a photo captioned “The controversial punctures on the neck of Elizabeth Wojdyla,” referring to an attack by the Highgate Vampire (Manchester 1985, 73). A cut (also called a laceration) is a tear or opening in the skin caused by an external injury. It can be superficial, affecting only the surface of your skin or deep enough to involve tendons, muscles, ligaments, and bone. A puncture wound is a deep wound caused by something sharp and pointed, like a nail. The opening on the skin is small, and the puncture wound may not bleed much [. . .] Puncture wounds caused by a bite or stepping on a rusty piece of metal, like a nail, need prompt medical attention. Although puncture wounds don’t normally bleed heavily, they are prone to infection. If the vampire used its fangs to bite the animals, as Manchester suggests, the wounds would be puncture marks, not lacerations. Manchester neglects to offer an alternate explanation for these wounds in his text, including strong possibilities like dogs, badgers or even another fox. After all, back in the 1970s Highgate Cemetery was an overgrown mess; and inhabited by a colony of wily urban foxes (“Highgate Cemetery” 2008). But if Manchester’s “lacerations” were accurate, they could have been inflicted on the dead animals by other means—sharp objects, like knifes. This leads to another possibility: what if the lacerations weren’t from a vampire or another animal, but a human being? Manchester quotes Ms. Joan Ferris saying: “I would not rule out the possibility of it being a human being. If it is, it’s someone with a sick mind.” (Manchester 1985, 44) It’s somewhat unlikely the vampire would’ve stabbed its victims when it was already equipped with sharp teeth. I tried reaching out to Joan Ferris during research for this article, but sadly found out she passed away from a contact in the Finchley RSPCA. However, I was able to obtain a copy of the Finchley Press article Manchester quoted from: Graham Newson’s “Animal Deaths—‘Vampire’ Theory” (April 13, 1979). The article paints a very different picture of the deaths that Manchester lets on in his book, despite selectively quoting from it. found unmarked but with their necks and back broken—some have even been carefully laid out in rows on garden lawns — and frenzied raids have smashed hutches to firewood and ripped apart galvanized wire cages. Werewolves. Great. We’ll go with the Alsatian theory instead. The Terrace Catacombs, Highgate Cemetery, London. Photo: Erin Chapman. One thing which was uncovered by the considerable research being carried out at the time was evidence of the remains of a Satanic ceremony in the murky depths of the catacombs. This included pieces of burnt crucifixes, dried blood, splashes of black candle grease, and traces of a curious mixture which when analyzed turned out to be deadly nightshade, rue, myrtle covered in sulphur and alum, the majority of which had been burned. Remains of a weird ceremony in the murky depths of the catacombs were also discovered. Evidence included pieces of burnt crucifixes, dried blood, splashes of black candle grease and traces of a curious mixture which when analyzed turned out to be a deadly nightshade, rue, myrtle covered in sulphur and alum, the majority of which had been burned. In both books, Manchester claims “a curious mixture which when analyzed.” What authority conducted the analysis of the mixture? Manchester didn’t think to mention such trivialities in his text. Nor does he explain how these burnt ingredients were correctly identified in the first place. But what’s the significance of these ingredients? Though Manchester doesn’t explicitly say it, they’re recognisable as components used in a Satanic ceremony called a Black Mass (Howard 2002). He said the first step in “their abominable work” was to resurrect the “King Vampire of the Undead,” with the help of the powers of darkness, and, with his aid, increase their cult. Convinced that the desecration was part of a secret Satanic meeting, Mr. Manchester has since exorcised the vault with an occult ceremony using crucifixes, candles, holy water and garlic. I was no less aware than today that tracking down the Satanists really responsible for increased black magic in north London would be a formidable task. The Highgate case showed clear evidence of the vampire’s living emissaries. Since the cemetery was now publicly exposed as a focal point of inhuman devilry, there was no likelihood of the coffin remaining within its confines. It occurred to me that the old chapel might well have been the clandestine method of exit by the Satanists, as an almost forgotten passage leads from the chapel beneath Swains Lane to the newer graveyard founded in 1852. Existing originally for the discreet trans-portation of coffins from the chapel to the tombs on the other side of the lane, this subterranean tunnel might have provided an ideal escape route for the unholy convoy. a magical ceremony and inversion or parody of the Catholic Mass that was indulged in ostensibly for the purpose of mocking God and worshipping [sic] the devil; a rite that was said to involve human sacrifice as well as obscenity and blasphemy of horrific proportions. And even if they were used to resurrect vampires, there’s no evidence they’d be successful at the task. Incidentally, the vault Manchester supposedly exorcised was the Family Vault of Charles Fisher Wace (Chapman 2015a); yet the Aug. 7, 1970 article makes no mention of the vampire’s supposed presence there, another classic example of Manchester’s evolving an often contradictory narrative. Plate of Ashurst House, ca. 1820, former residence of London’s mayor, William Ashurst (1647–1720) was situated where St. Michael’s Church now stands. 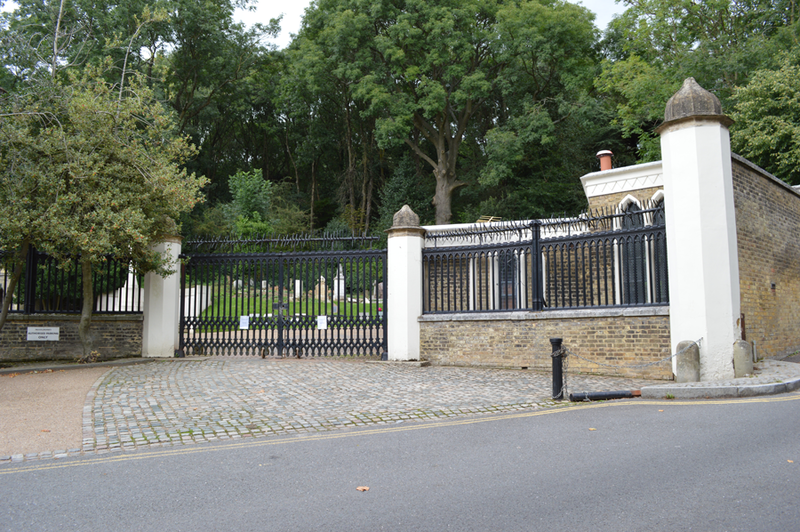 The mansion’s grounds were used for Highgate Cemetery. Photo: British History Online. “[Manchester’s] theory is that the King Vampire of the Undead, originally a nobleman who dabbled in black magic in medieval Wallachia, “somewhere near Turkey,” walks again. St. Michael’s Church which overlooks the haunted catacombs of Highgate, is built on the site of a mansion [Ashurst House] once owned by Sir William Ashurst, Lord Mayor of London in 1694. The mansion was demolished in 1830 and its grounds now form the larger part of the cemetery. But after the death of Sir William in 1720 — at the height of the vampire epidemic which had its origins in south-east Europe — a nobleman came to these shores (transported in a coffin, according to one story I have been told by someone in the area) and leased the property which cast its shadow where now stands the Columbarium. From that time onwards there have been reports of strange incidents not unlike the outbreak at the turn of the seventies. felt it reasonable to surmise that the arrival of this European nobleman (in most odd circumstances according to one source) and the phenomenon’s commencement was more than just a coincidence. Moreover, being at a time when the undead pestilence was sweeping across the Continent, I felt justified in laying all the local trouble at the feet of this mysterious visitor who bore all the hallmarks of a vampire. He [William Ashurst] died in 1720 and the impressive three-storey mansion, known as Ashurst House, was sold and leased to a succession of tenants of whom one was a mysterious nobleman from the Continent who arrived in the wake of the vampire epidemic which had its origins in south-east Europe. Strange incidents began to haunt the area with reports of “hobbs, ghaists and daemons” abounding. The 1680s and 1690s saw new gentlemen’s houses on the south and west sides of the green, where attractive sites had been monopolized by Arundel House and Dorchester House. The Arundel House estate was sold in 1670 by Sir Robert Payne’s son William to Francis Blake, who divided the mansion and allowed his younger brother William to occupy the banqueting house farther west. Andrew Campion, a later purchaser, moved to a new residence, afterwards South Grove House, on the western part of his land in 1675. He sold the banqueting house itself to William Blake, who adapted it for his ill-fated Ladies’ Hospital. William Blake made way in 1681 for his son Daniel, who soon conveyed the property to his father’s creditor Sir William Ashurst, later lord mayor of London (d. 1720). Ashurst replaced the western part of Arundel House with Old Hall in the 1690s and also chose the site of the banqueting house for a grander residence. Ashurst House, sometimes called the Mansion House, impressed Defoe. It was a large square building set back from the green, at the end of an avenue later marked by the approach to St. Michael’s church, and commanded formal gardens stretching much farther down the hill than those of its neighbours. The house was sold by Sir William’s grandson William Pritchard Ashurst to John Edwards (d. 1769) and leased by Edwards’s descendants Sarah Cave and Sarah Otway Cave, whose tenants included the judge Sir Alan Chambré (d. 1823). After serving as a school, Ashurst House was bought as the site for a church in 1830. Volume 17 of Survey of London (1936), edited by Percy Lovell and William McB. Marcham, elaborates on all tenants who resided in Ashurst House between 1674–1830 before the land was sold to H.M. Commissioners for Building New Churches (“Ashurst House” 1936). Therefore it’s obvious Manchester’s “foreign nobleman” only existed in Manchester’s imagination. And if the nobleman was born there, it’s more than likely the vampire was too. 1 Manchester denies using the term “King Vampire” in the article, citing it as a “Draculesque adornment preferred both by [folklorist Bill] Ellis and the journalist responsible for the front page press report” (Manchester 1997, 72). 2 This xenophobic attitude is not so surprising in light of recent revelations concerning Manchester’s penchant for Nazism (Chesham n.d.). “Ashurst House and St Michael’s Church Monuments.” 1936. In Survey of London, edited by Percy Lovell and William McB. Marcham. Vol. 17, The Parish of St Pancras, Part 1: the Village of Highgate, 54–62. London: London County Council. Accessed April 21, 2015. http://www.british-history.ac.uk/survey-london/vol17/pt1/pp54-62. Baggs, A.P., Diane K. Bolton, M.A. Hicks, and R.B. Pugh. 1980. “Hornsey, Including Highgate: Highgate.” In A History of the County of Middlesex, edited by T.F.T. Baker and C.R. Erlington. Vol. 6, Friern Barnet, Finchley, Hornsey with Highgate, 122–35. London: Victoria County History. Accessed April 30, 2015. http://www.british-history.ac.uk/vch/middx/vol6/pp122-135. Baker, Y. 1970. Letter to the editor. Hampstead & Highgate Express, Feb. 27, 10. Berger, Pauline. 1970. Letter to the editor. Hampstead & Highgate Express, Feb. 27, 10. “The Black Mass.” n.d. Satansheaven. Accessed April 13, 2015. http://www.satansheaven.com/black_mass.htm. Chapman, Erin. 2014. “Seeking Vampires in London.” Vamped, Nov. 16. Accessed Dec. 6, 2014. http://vamped.org/2014/11/16/seeking-vampires-in-london/. ———. 2015a. “5 Reasons a Wampyr Didn’t Walk in Highgate Cemetery.” Vamped, Feb. 27. Accessed March 31, 2015. http://vamped.org/2015/02/27/5-reasons-why-a-wampyr-didnt-walk-in-highgate-cemetery/. ———. 2015b. “Cemetery Logistics: How I Tracked the Highgate Vampire.” Vamped, April 4. Accessed April 5, 2015. http://vamped.org/2015/04/04/cemetery-logistics-how-i-tracked-the-highgate-vampire/. Chesham, Kevin. n.d. “Kevin Chesham – The Autobiography – First Extract.” Kevin Chesham – Triathlete. Accessed May 27, 2015. http://kevchesham.blogspot.co.uk/p/kevin-chesham-autobiography-first.html. “Does a Wampyr Walk in Highgate?” 1970. Hampstead & Highgate Express, Feb. 27, 1. Ellis, Bill. 1993. “The Highgate Cemetery Vampire Hunt: The Anglo-American Connection in Satanic Cult Lore.” Folklore 104 (1–2): 13–39. Farrant, David. 1970a. “Ghostly Walks in Highgate.” Letter to the editor. Hampstead & Highgate Express, Feb. 6, 26. ———. 1970b. Letter to the editor. Hampstead & Highgate Express, Feb. 27, 10. “The Ghost Goes… on TV.” 1970. Hampstead & Highgate Express, March 13, 1. “Horror Film Club Hoax Sparks a ‘Vampire’ Hunt.” 1970. Palm Beach Daily News, March 17, 7. Accessed May 25, 2015. https://news.google.com/newspapers?nid=1961&dat=19700317&id=A8stAAAAIBAJ&sjid=HJcFAAAAIBAJ&pg=4647%2C1993095&hl=en. “Highgate Cemetery.” 2008. BBC. Last modified Oct. 27. Accessed Dec. 7, 2014. http://www.bbc.co.uk/london/content/articles/2005/05/10/highate_cemetery_feature.shtml. Howard, Jim. 2002. “The Incense of the Black Mass in Huysmans’ La-Bas.” Synagoga Satanae, October. Accessed Dec. 14, 2014. http://www.angelfire.com/az3/synagogasatanae/incense.htm. “‘I WAS THE VAMPIRE. '” 1970. Hampstead & Highgate Express, March 20, 1. Kahn, April. 2014. “What Causes Puncture Wound? 6 Possible Conditions.” Medically reviewed by George Krucik. Healthline. Accessed Dec. 5, 2014. http://www.healthline.com/symptom/puncture-wound. Manchester, Sean. 1985. The Highgate Vampire: The Infernal World of the Undead Unearthed at London’s Famous Highgate Cemetery and Environs. London: British Occult Society. ———. 1991. The Highgate Vampire: The Infernal World of the Undead Unearthed at London’s Highgate Cemetery and Environs. Rev. ed. London: Gothic Press. ———. 1997. The Vampire Hunter’s Handbook: A Concise Vampirological Guide. London: Gothic Press. Newson, Graham. 1979. “Animal Deaths—‘Vampire’ Theory.” Finchley Press, April 13, 1. Swale, Trystan. 2014. “The Highgate Vampire – An Exercise in Deception?” Mysterious Times, March 27. Accessed Dec. 13, 2014. http://mysterioustimes.wordpress.com/2014/03/27/the-highgate-vampire-an-exercise-in-deception/. “That Vampire Back Again.” 1970. Hampstead & Highgate Express, Aug. 7, 1. “Why Do the Foxes Die?” 1970. Hampstead & Highgate Express, March 6, 1.